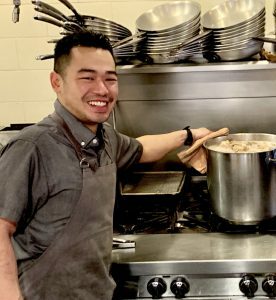 Nearly three years in, Chef Varin Keokitvon has assembled what he calls one of his strongest kitchen teams to date. Here’s a look at the folks behind the knives in our kitchen. Jesse Dent grew up in a restaurant family in Seattle”s Greenwood neighborhood. Not only did both of his parents work in a restaurant, they even owned a restaurant at one point. What have you learned since joining Heartwood Provisions? For me, it’s definitely exposure to the ingredients we use. Before I started here I’d never worked with things like bone marrow. Or the ingredients with a heavy Spanish influence that come from Varin’s experiences, like pimenton or the Iberico pork leg. How have you grown? What can you do or cook now that you couldn’t before? A lot of my past experience was production work—pumping out a lot of food. While that’s valuable, we make so much in-house, like sauces and purees, that I had never thought of. Before, I thought that you only get mayo from a jar. Now I know that if you have the tools, you can make a product on your own and put your own twist on it – and make it better. What’s your greatest kitchen skill? I’ve heard I’m really good at delegating. When I’m cooking at home—even with family members—I’ve been told I’m good at telling people what to do, and how to master a form. Mostly I’ve learned techniques. The jerky at work—in the beginning, my forearm would hurt so bad. But, I’ve learned how to clean-cut versus saw-cut. And, there are pastry things that I would have never have known before. You could give me a recipe, and I could make it, but… Varin’s very patient. You can tell that teaching is his thing. I idolize him. I look up to him. When cooking on your own, what do cook? For the kids, eggs. Toast sandwiches. Rice. Chicken. Last night, my brother and I made ceviche. (We’re neighbors.) Cooking is very common in our family. We get together and cook often. When cooking on your own, what do you cook? For the kids, eggs. Toast sandwiches. Rice. Chicken. Last night, my brother and I made ceviche. (We’re neighbors.) Cooking is very common in our family. We get together and cook often. Are there ingredients you’ve been introduced to here? Spanish and Laotian ingredients, especially. I come from busy restaurants with huge covers. I moved from a place where you’re moving as fast as you can to a place where detail matters; where the plate is structured for a reason. Chef Varin has opened my eyes to things I wouldn’t have seen before. At Heartwood I’m literally learning every day. Born in Tacoma and raised in Renton, Sok moved to Massachusetts, where he worked in his uncle’s restaurant. When he returned to the West Coast, he joined the Army National Guard. 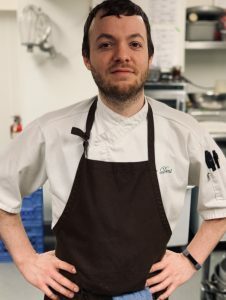 During his second tour he got into Cordon Bleu in Tacoma, which eventually led to a volunteer opportunity Taste of Washington, which led to a job at the Metropolitan Grill. When Heartwood opened it was a chance for new adventure and Sok happily followed along. I like to think I’m pretty good on the grill, especially grilling meat. I’m the grill guy. What’s your greatest kitchen weakness? Conversions. Math conversions. I’m horrible at those. It’s a good thing I’m not a baker. I’ve got it down now, but… math. You use it or you lose it. Are there ingredients you’ve been introduced to? So many. Fiddlehead ferns, for example. I didn’t know you could eat them, let alone pickle them, as we’re doing now. I’ve learned how to really make a stock. They teach you how to make a demi in culinary school, but to bring it all down and make a deluxe chicken redux… well, I can do that now. Born and raised in Covington, Washington, Kim started cooking in high school through a great program called Prostart. A program that culminates in a national cooking competition every year. Kim’s teacher was intrigued with her excitement and talent, so naturally she pushed her. By the time she was a senior she was leading cooking demo’s for the class. She fell in love with cooking, and when the time came after graduation she decided to go to culinary school. How has your role evolved in the company? I was hired as one of the opening sous chef’s 3 years ago. 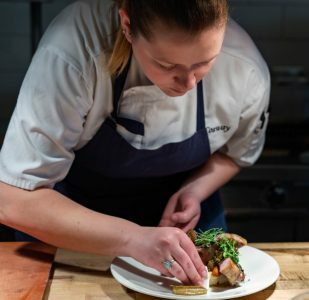 I worked the line at Heartwood for a year and a half, then perused another opportunity within the company and returned to Heartwood in September of 2018 after accepting the Chef de Cuisine position. My time at Heartwood has introduced me to so many new things!! There are too many to name them all. Some stand outs…..isomalt, finger limes, sprouted lentils and aji Amarillo. 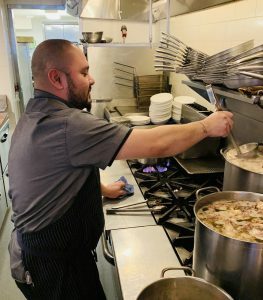 Did working in the front of house impact your process when returning to the kitchen? Working in the front of the house had a huge impact on my process of returning to the kitchen. After cooking for 10 years, I needed to step away for a little bit. I was feeling burnt and tired. Working in the front opened my eyes to so much. It pushed me out of my shell, and gave me a new level of confidence. 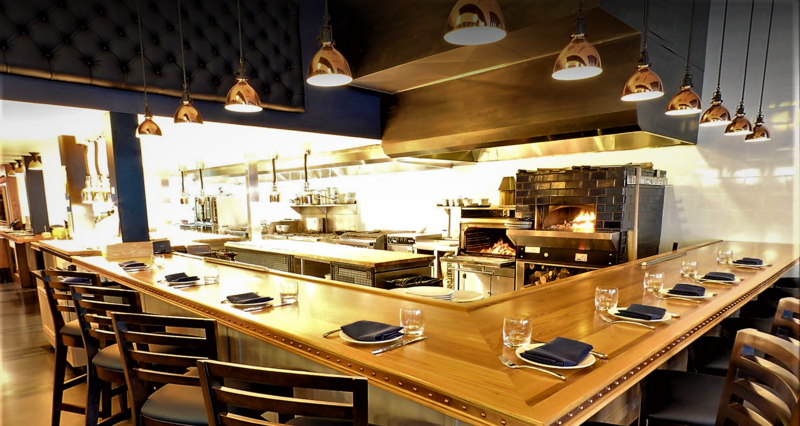 Now after four months of being back in the kitchen, I am more open to talking to people at the chefs counter. I really enjoy delivering food to tables and talking for a minute. I now know how to taste wine properly which has really been helpful when Amanda and I are pairing beverages. I feel refreshed and like I have seen every side of this level of the restaurant industry. I am so thankful I was given the opportunity, it has truly changed the way I think.